Topaz is a silicate mineral that can be many different colors. Blue, yellow, clear, brown, green, and rarely pink. 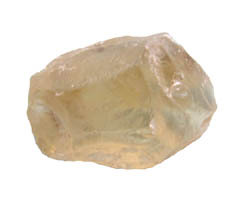 Topaz color is often manipulated using heat and radiation to increase the value of the stone. The fact that it will take a high polish and is very hard makes it popular in jewelry. The chemical formula is Al2SiO4(F,OH)2. Aluminum silicate fluoride hydroxide. It is a very hard mineral an 8 on the MOHs scale. Only Diamond and corundum are harder. It has a prismatic habit and is from the orthorhombic crystal system. The luster of topaz is vitreous and it has a colorless streak. It is transparent to translucent. The main producers of topaz in the world are Russia, Brazil, and Nigeria. But gem quality crystals are also found in Colorado, Texas, and California. Location: Russia, Brazil, and Nigeria, Colorado, Texas, and California.